By default, the MyEnlighten desktop application displays energy production and consumption data as a grid. If you prefer to see this information as a graph, click the graph icon at the right corner above the grid. The screen updates to show the energy graph in the main display area. A small version of the energy grid displays below the graph. Like the grid, the graph displays energy production in watt-hours (Wh) for Months, Days, and Hours. The Days view displays by default. Months – to view energy produced or consumed in one calendar year. Click the left double-arrow ( ) to view the same month in the prior year, and the right double-arrow ( ) to view the same month in the following year. Days – to view energy produced or consumed for a calendar month. Click the double-arrow icons to view the same day in the previous or following month. Hours – to view energy produced or consumed in one 24-hour day. 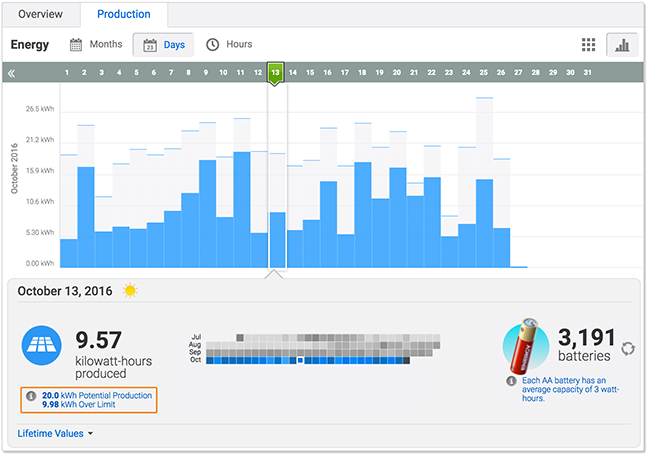 Each column shows the energy produced for a 60-minute period in a 24-hour day. Use the single-arrow icons to move the hourly range. Click the double-arrow icons to view the same hour in the previous or following day. If your utility limits how much power your solar energy system can export to the utility grid, the graph displays Potential Production in addition to actual production on the Months and Days view of the graph. Potential Production is the amount of energy your system would have produced if this limit were not in place. Over Limit is the amount of potential production that would have exceeded the export limit set by your utility. On the graph, actual production is shown as a blue bar. The grey area above the blue bar shows the over limit amount, and the potential production is indicated by the thin blue line at the top of the grey bar. 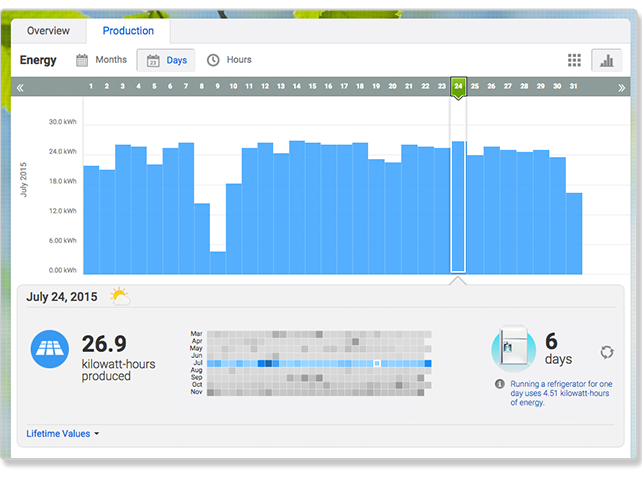 You can also access your production data as a graph in the Enlighten mobile app. Simply tap through to the Energy screen.